DROP A DRESS/SHIRT SIZE IN 6 SESSIONS! Drop My Dress/Shirt Size Workshop is a 6 weeks program targeting specifically to tone your body and reduce your body fat. Pilates is gentle on your joints and injuries but hard on your muscles! Suitable for the obese, injured or anyone who have not worked out for a long time. Gain lean, toned, long muscles with Pilates Reformer & Chair in 6 weeks. Each workshop is limited to a maximum of 10 participants. Participants have to attend the same slot every week over 6 weeks. You have to attend at least 5 group classes before you can sign up for this workshop. HOW IS IT DIFFERENT FROM THE STANDARD GROUP CLASS? 💜 Body analysis and interview conducted before the workshop to help you set your targets and for us to customise the 6 weeks program. 💜 Progress tracking by instructor to accelerate improvement. 💜 Weekly class routine is created based on your progress to address specific issues of the 10 participants. 💜 Limited to 10 participants per workshop. 💜 You will need to sign up a new Drop My Dress Size Workshop bundle to participate in this workshop. 💜 In the event that you are unable to attend a class, you can use the class credit to attend any group class across 3 Pilates Fitness studios. #1 CHOOSE YOUR SLOT AND STUDIO. #2 PURCHASE WORKSHOP BUNDLE ONLINE. BUY WORKSHOP BUNDLE ONLINE NOW! Each class is 55 minutes long. Six 55 minutes class workshop bundle is $330.00. Early bird discount of $270 per Workshop Bundle is valid till 10 February 2018. You have to purchase Workshop Bundle in order to attend the workshop. Existing group class bundle cannot be used to attend the Workshop Bundle. If you choose Telok Blangah or Serangoon Garden studio, the workshop is conducted using only Reformer. If you choose River Valley studio, the workshop is conducted using only Chair. You have to attend at least 5 Chair/Reformer group classes before you can sign up for this workshop. Sign up and pay for your workshop bundle slot. If you are unable to attend one of the workshop session, you can use the class credit to attend any group class across our 3 studios. Joining fee is not required. The 6 classes are valid for 2 months from the first workshop date. We will close the workshop slot once first 10 participants have paid. These classes can be counted towards the FLOW CHALLENGE. RELIEVE TIGHT SHOULDERS & NECK IN 6 SESSIONS! Heal My Stiff Shoulders & Neck Workshop is a 6 weeks program targeting specifically to reduce pain and tension on your shoulders and neck. 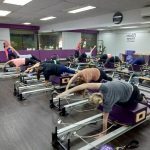 If you find these Mat Pilates exercises beneficial, reap the full benefits from our Pilates Reformer Workshop to Heal Your Stiff Shoulders and Neck! 💜 You will need to sign up a new Heal My Stiff Shoulders & Neck bundle to participate in this workshop. Each class is 55 minutes long. Six 55 minutes class workshop bundle is $330.00. Sign up and pay for your workshop bundle slot. If you are unable to attend one of the workshop session, you can use the class credit to attend any group class across our 3 studios. Joining fee is not required.